Description: Lode Runner is a level platformmer maze game where you play a character who's only goal is to collect all the gold hidden through out the maze and open up a latter to climb to the next leve.. Also running around in the maze are three to five bad guys who's goal it is to stop you. Your character has a gun however, he can only dig holes with this gun. Similar to Apple Panic as you dig holes the bad guys will fall in, and also like Apple Panic after a few seconds the hole will begin to fill in. There is almost no AI to the enemy characters. When one does fall into a hole you're able to run over them without being captured. If the enemy falls into freshly dug hole he will be able to climb out after a few seconds. Hoewver if the hole is a few second old and an enemy falls in the hole will fill up and the enemy will then be buried... a few seconds later a new enemy will fall from the sky to take his place. (or is it the same enemy just reincarnated?) Enemeys who fall into holes with no bottom get stuck while your character will fall through the hole to the level below. If you're character falls into a hole with a bottom the hole will close up and you loose a life. Lode Runner's maze/puzzle aspect is what makes the game. The orignal game had over 200 different mazes to solve and stats off simple enough but got more and more difficult. Most mazes require digging multiple holes to get to buried gold. If a bad guy runs over a gold bar they will pick it up and carry it requiring the player to dig a hole to trap them in. As the bad guy falls into the hole they drop the gold. 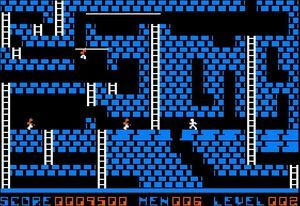 Lode Runner was one of the first games that I can remember which had a sequel and "expansion packs", the first being Championship Lode Runner. It was also one of the first games which included a level editor/creator. By adding these features Broderbund extended the life & reach of this game with user generated content. 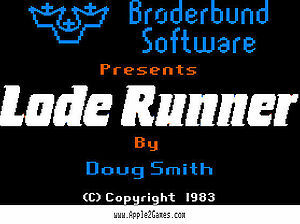 There were BBSes dedicated to Lode Runner games and home brewed expansion packs were everywhere. 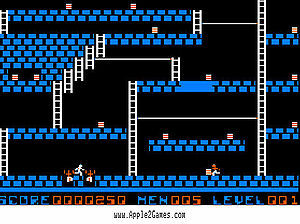 Lode Runner was ported to the NES and also a version was built into a coin op arcade machine and variants can still be seen in games today. every chest of Bungeling booty. the screen and enter the next level. safely. If stuck in a "dead end,"
means of death or escape. CTRL-S = toggles sound ON/OF. CTRL-X = flips x-axis on joystick. CTRL-Y = flips y-axis on joystick. other than the first (level 001). saving your own game creations. !  ! WHAT TO DO ! HOW TO DO IT   ! !1.! enter    !press CTRL-E from ! !  ! "edit mode" !demo mode         !
! !data disk   !your data disk"   !
! !into drive  !                  ! !3. !design your !use I-J-K-M keys  !
! !game        !to move cursor;   ! !  ! !use 0-9 to make   ! !4.! save your  ! press CTRL-S   ! !  ! game     !                  ! !5.! play your  ! press CTRL-S to  ! !  ! game     ! "quit" game    !
! !            ! generator    !
! !            ! press P to "play"! First you must enter Edit mode. your Lode Runner master disk. board you want to work on (001-150). in the number, then press RETURN. The selected screen will appear. master disk for this purpose. GAME GENERATIOR, EVEN TO PLAYTEST. INCLUDED IN YOUR GAME BOARD DESIGN. more than five, no less than one. forward or back arrow keys. control is returned to demo mode. again with a clean slate. the disk (blanks the board). for use with a data disk only. the game will return to demo mode. This page was last edited on 3 September 2016, at 07:55.